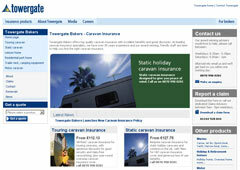 Towergate Bakers have agreed exclusive deals for www.insuranceforcaravans.co.uk that are not available anywhere else. The only way you can get these discounts is by calling us on 0844 892 1419 or click on the ’Get a Quote’ button below, complete a few details and we will call you when it’s convenient for you. Towergate Bakers have a strong reputation in their chosen markets and we have been providing Award insurance for over 35 years. We treat our customers how we like to be treated ourselves and therefore manage all our customer’s claims for them in house, so you don’t have to deal with the insurance company. When you insure through Towergate Bakers you have us on your side, every step of the way. Towergate Bakers is a trading name of the Towergate Underwriting Group Ltd, authorised and regulated by the Financial Services Authority.